All our hardwood worktops are made to order in our Yorkshire factory by our skilled craftsmen and are supplied in beautiful full-length staves. Care is taken when selecting each piece of timber, ensuring that you receive a stunningly finished worktop that will last you a lifetime. Stave widths are arranged in production for maximum stability, but are usually between 90mm - 160mm wide. 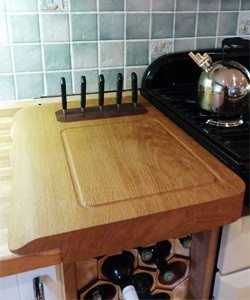 In all but the longest worktops, each stave runs the full length of the top. 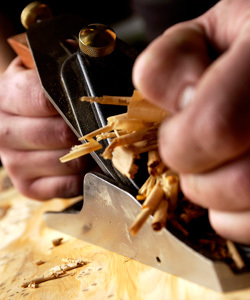 Staves are machined with a combed glue joint which aids construction and provides a strong joint. 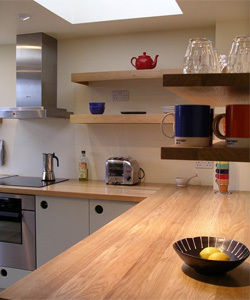 Our prices are per metre based on a standard 600mm wide by 40mm thick. However any length and width can be made - prices available on request. Due to the bespoke nature of this product, delivery charges are based according to size and location (price on application). Refinements such as belfast sink cut-outs, drainer grooves and radius corners will need to be produced on site.